Today I have published my 300th post! 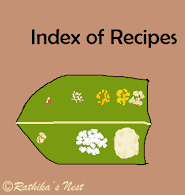 It has been an eventful journey, during which I have covered more than 200 recipes in addition to articles, paintings, stories and musings on ‘Rathika’s Nest’. This feat would not have been possible without the support of readers, friends, followers, contacts and fellow bloggers. My sincere thanks and appreciation to one and all for your kind patronage! Ninth day of ‘Navarathri’ (நவராத்திரி) is celebrated as ‘Saraswathi Pooja’ (சரஸ்வதி பூஜை) or ‘Ayudha Pooja’ (ஆயுத பூஜை). On this day, prayers are offered to ‘Saraswathi’ (சரஸ்வதி) – Goddess of wisdom and knowledge, seeking her benevolence in furthering one’s knowledge and skills. Whereas, this day is celebrated as ‘Ayudha Pooja’ at work. At home, Saraswathi doll or picture is decorated with flowers. Books, musical instruments, writing tools and any other implements used for expressing one’s skills are placed on a wooden pedestal in front of the ‘kolu’ (கொலு). This pedestal is covered with a new cloth, decorated with flowers and worshiped by offering special prayers. This arrangement is left undisturbed for a day. On this auspicious day, vehicles such as car, motor cycle or bicycle would be washed, decorated with garland of flowers (பூமாலை), sandal paste (சந்தனம்) and kumkum (குங்குமம்). On the tenth day or ‘Vijayadasamai’ (விஜயதசமி), after performing pooja, the books and implements would be removed from the pedestal. Elaborate feast prepared for ‘Saraswathi Pooja’ would invariably include ‘payasam’ (பாயசம்), ‘vadai’ (வடை) and ‘chick pea sundal’ (கொண்டை கடலை சுண்டல்) among others. 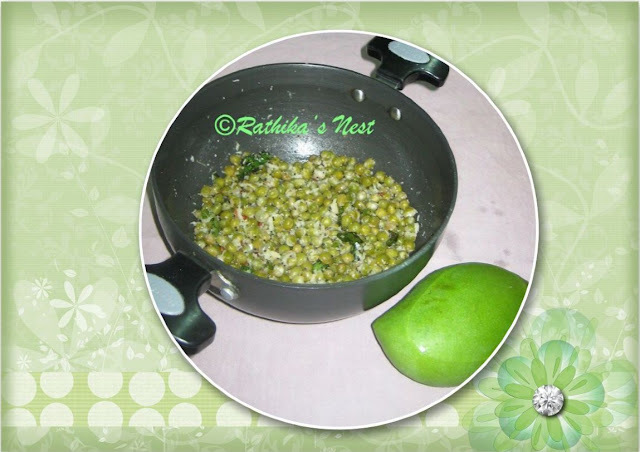 Today let me share the recipe of famous ‘Coconut-Mango-Dry Peas Sundal’ (தேங்காய் மாங்காய் பட்டாணி சுண்டல்). Those who have visited Chennai beaches would have come across vendors selling this popular snack. Adding of mango to cooked peas gives a wonderful tangy taste to the sundal. Method: Wash and soak dried peas in sufficient water overnight or at least 6 hours. Later drain and pressure cook peas with salt and ½ tumbler or 100ml of water for 5 minutes or 5 whistles. Once the pressure subsides, remove the peas from the cooker. Drain excess water and keep aside. Heat oil in a kadai, add mustard seeds and when they start to sputter, add urad dhal. Fry till the dhal turns golden brown. Now add the cooked peas, grated mango, ginger, green chilli and asafoetida. Mix well. Now add coconut gratings. Sauté for 2 minutes and then, switch off the fire. Garnish with curry leaves. Serve hot.